Limes Romanus - The Roman antique monuments on the Middle Danube is part of the Tentative list of Slovakia in order to qualify for inclusion in the World Heritage List. The Slovakian extension to the Roman Frontier Fortifications is minor but in my opinion highly important to the history of the Roman Empire. There are only two locations in Slovakia due to the Danube being the natural border between the Germanic and Roman forces. I went to the museum near Bratislava just across the river, far enough outside the city to actually not be Bratislava anymore but more importantly nowhere near bad traffic. 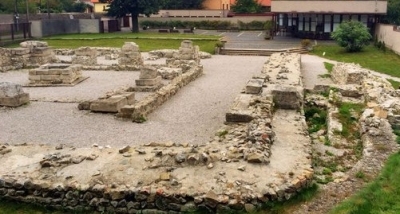 The museum is called Ancient Gerulata Rusovce and features a small Roman military camp. It has several layers of buildings from different time periods, most of them just presented by walls. The inside of the museum contains a lot of billboards for history fanatics and explains the region's fortification very well. The reason I found the camp important is that the Romans first did not cross the river due to logistic reasons but later on Emperor Antoninus no longer wanted to fight a war with the Germanic tribes and even had peace treaties. After going through the inside for around 20 minutes you can still see the outside from a viewpoint but there is not much to see that you couldn't glance at during your walk to the museum. The museum doesn't cost much, parking should be easily found nearby (although I'm not sure why they can't add a few spaces for the museum just outside the gate), and for anyone near Bratislava I would recommend going here. I also regret driving by Iza, the second location, but at the time I didn't think it was worth going to another similar location and I think was mostly curious how come it is on the other side of the Danube.